Feed-in-Tariff – Generation tariff of 16p/kWh and export tariff of 4.64p/kWh for 50% of units generated. This has increased slightly from 1st April 2013. Everything was installed in one day and the installers cleaned up after themselves. 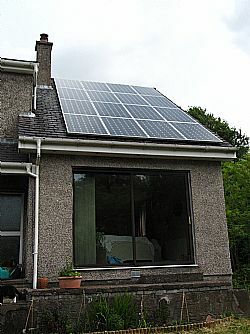 Originally the owner was contacted by a cold caller who recommended that she should install PV panels. A price of £10,670 was quoted with a massive payback of £74,000 predicted. After talking to a friend in the sustainable building business and another who had PV panels the owner searched around for another offer giving a realistic forecast, which instilled more confidence! Electricity for Free did all the consultation process remotely (using internet maps) and processed the order speedily so as to meet the last cut off date for feed-in-tariffs (end of Oct 2012). Once the chosen installer got involved the whole process took a matter of two and a half weeks. In order to claim feed-in-tariffs the owner needs to phone in her metre reading every three months (the payment is then made via BACS about a week later). 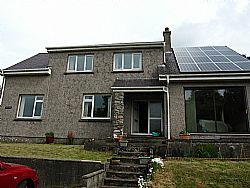 The owner felt that with the current economic climate producing low bank interest rates a much better investment of her savings would be to install a renewable technology. As the household has a low hot water consumption rate and an efficient wood burner for heating, she decided that electricity generation was the way to go. When considering what supplier to go with, she followed a recommendation from a friend. The PVs are predicted to generate 3600 kWh every year. On feed-in-tariffs alone this would mean the panels take 12 years to pay for themselves. This period will be reduced by the savings from the electricity bill but it is too early to comment on how much this will be.